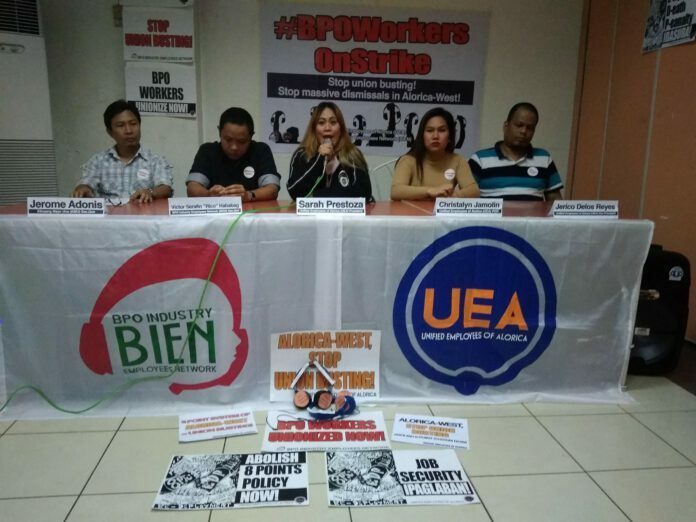 Members of BPO Industry Employees Network (BIEN) and Unified Employees of Alorica (UEA) announce BPO workers' strike after filing a notice at the Labor Department. Photo grabbed from BIEN's Facebook page. One thousand-five hundred members of the Unified Employees of Alorica (UEA) are set to hold a strike in the coming days after they filed a notice before the National Conciliation and Mediation Board (NCMB) of the Labor Department last September 7. The announcement was made in a press conference today by members of the UEA along with the BPO Industry Employees Network (BIEN). Call center agents of Alorica’s West Contact Services, Inc., said that the upcoming strike is a testament to the plight of BPO workers. UEA and BIEN said that Alorica workers have become victims of illegal dismissals, systematic attrition through company policies, and other labor standard violations. “As this also happens in many other BPO companies, Alorica proves how bad the situation is, yet BPO workers will not stay mum on the issue. They will act to change the situation themselves,” BIEN Secretary General Rico Hababag said. UEA President Sarah Prestoza noted that the attacks on the union intensified early this year, with violations on BPO workers’ job security. She said that Alorica-West implemented an ‘Eight-Point System’, where workers are terminated if the combined total of their absences and tardiness reaches eight. Since the implementation of the Eight-Point System, 200 union members have been illegally terminated or were forced to resign. “We cannot allow this rampant and blatant violation of our rights to continue. We have devoted much of our skill, time, and efforts in serving the company and yet we are relentlessly deprived of our rights,” Prestoza said. In August, UEA filed for preventive mediation proceedings before the NCMB. The union filed complaints for union harassment and ‘union busting’ schemes being implemented by Alorica and West management through the ‘Eight-Point System’, the employment development program, and redeployment program. They also reported that there was no due process during administrative hearings of cases. After several rounds of mediation proceedings, the parties failed to come up with an agreement as the management is stern in its position to deny its recognition of UEA, to address employees’ concerns “individually” and without a union, and to continue its attacks on job security. UEA and BIEN also said that the industry’s hostility to workers unions and labor groups has deprived workers of their constitutional right. Forming a union is covertly and overtly prohibited by BPO companies. In most employment contracts and in companies’ codes of conduct, workers are discouraged to form an organization. “Amidst this prevailing hostile environment for unions in the BPO industry, the union, UEA, was able to persist and prevail despite systematic attacks from the management,” Hababag said. They also encouraged the Filipino public to support the impending strike, the first of its kind in the BPO industry. “The public, especially BPO workers, should closely monitor the moves of the whole BPO industry, especially under IBPAP and the Duterte government’s future action on this fight. This will have lasting consequences for the rights and welfare of over one million Filipinos who are serving BPO companies,” Hababag said.